United Launch Alliance (ULA) — the company that launches most of America’s science probes and spy satellites into space — has unveiled its next generation “Vulcan” rocket, which is scheduled to blast off from Vandenberg Air Force Base in 2019. 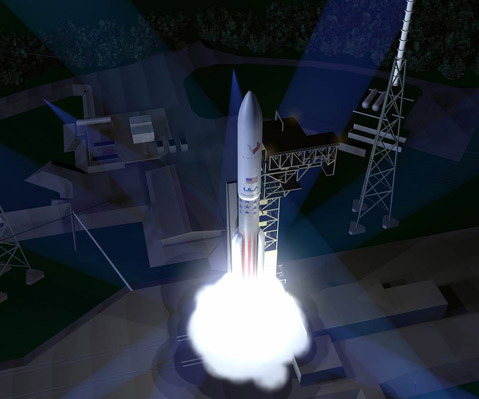 The Vulcan will eventually phase out ULA’s Atlas and Delta rockets and will feature all-new, all-American engines. Right now, Russian-made motors power the Atlas and Delta lines. The Vulcan’s new liquid-fuelled engines are being developed by Blue Origin, which is run by Amazon chief Jeff Bezos. During a press conference this week, the leaders of ULA — a joint venture between Boeing and Lockheed Martin — told reporters that the engines are being designed to return to Earth so they can be reused. This will cut costs enormously, they explained, by about $100 million for medium-lift boosters and about $200 million for heavy-lift models. After separating from the rocket’s upper-stage, the engines will detach from the fuel tanks and fall back to Earth as they deploy a heat shield to protect them during re-entry, ULA said. The engines will then release a parachute and be plucked from the air by helicopter. ULA’s CEO Tory Bruno wouldn’t disclose how much the Vulcan’s development will cost, but he did say such efforts typically run around $2 billion.